This seems to be the year for weddings for our friends and family. We’ve already attended a few and have at least one more left this year. From all these weddings, I’ve definitely picked up on a lot of cute ideas that I’m planning on sharing on this blog. 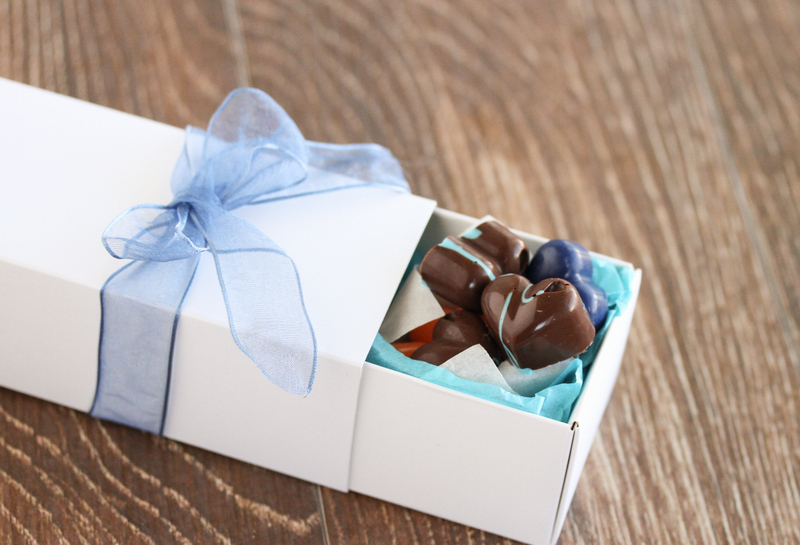 One idea for a party favor are customized chocolates. They are easy to make, and you can make them in the wedding theme colors. You can also customize the flavor by adding flavor oil extracts. You should be able to find all your supplies at your local bakery supply store. For a recent bridal shower, I made these heart chocolates. I made them in orange (tangerine flavored), blue (blueberry flavored), and chocolate colored with blue swirl lines (coconut flavored). My favorite ones were the swirly ones but it took me a while to get the hang of it and the ones in the pictures are actually only of the first batch. The second batch looked even better but I didn’t get a photo of those. I also purchased some candy foil wraps to wrap them in after so that they wouldn’t get messed up in the favor boxes. In a bowl, melt chocolate in microwave, at 30 second intervals. Stirring after each interval until chocolate is completely smooth. If you plan on making colorful chocolate, use the white chocolate melts or white chocolate chips. Add in the a few drops of oil based food coloring and stir, until you have the shade of color you are looking for. Add in a few drops of the flavor oil extract of your choice and stir into chocolate. Oil extracts tend to be strong, so you want to start off a few drops at a time and then taste. I used about 1/2 tsp for each batch. Spoon chocolate into silicone molds. When finished, tap the mold several times on counter, which should cause the chocolate to settle and have a flat surface. If you want to do a swirl design, use milk chocolate chips and melt at 30 second intervals. Add in extract flavor and mix. In a separate bowl, melt about 1/2 cup of white chocolate chips. Add in food coloring until desired color is reached. 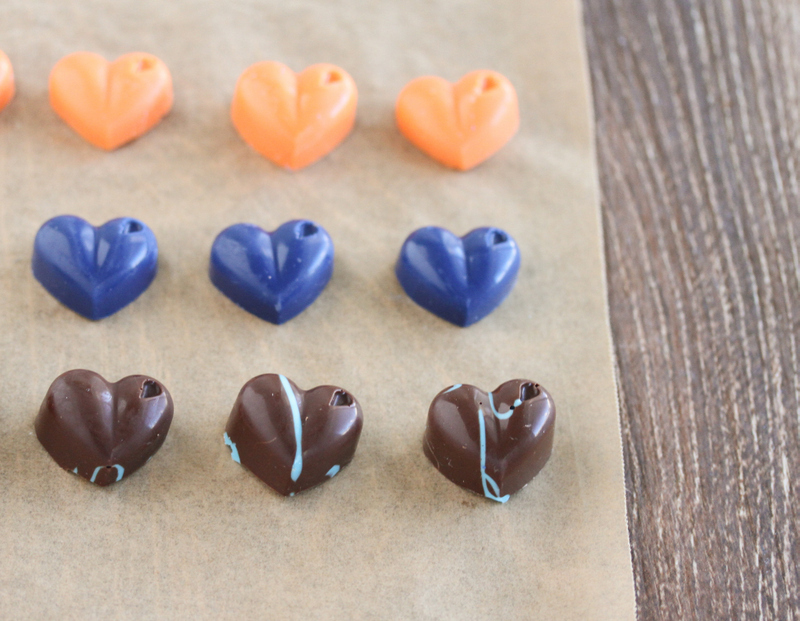 Put colored chocolate into a piping bag. Pipe design across silicone molds. Work quickly as chocolate will begin to harden fast. After you have piped design across all molds, spoon in the milk chocolate on top, over the piped design. Once finished, tap mold on counter a few times so that chocolate settles evenly. Place in fridge for about 30-1 hour until chocolates are firm. 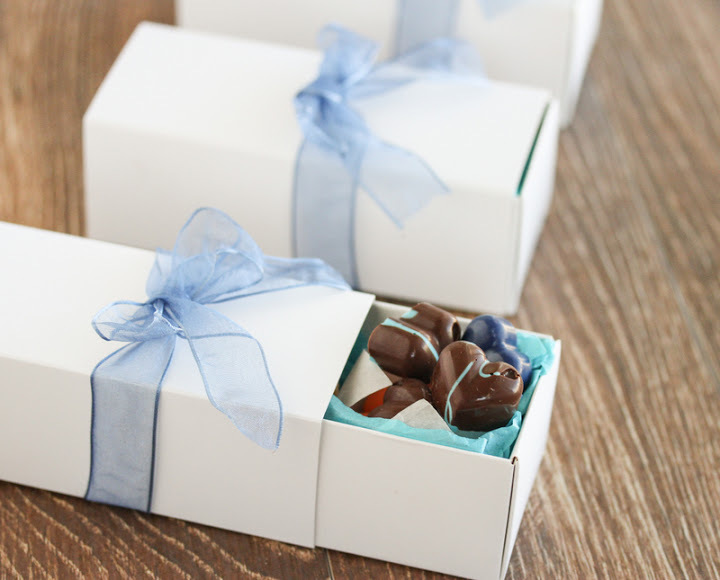 Pop chocolate out of mold and place into candy boxes or wrap in candy foil. Store in a cool place or in fridge.